For someone as chatty as I normally am, especially in my role as a legislator, I have certainly been quiet on my webpage. And in the opinion pages. There are only a couple of reasons for this: the intensity of the work this year and the lack of time. That’s about to change! First, we are on our annual Town Meeting break, which means representatives will be attending their towns’ meetings over this weekend, through until Tuesday. Unless they don’t have one (Burlington!) or have one later in the month or year (Brattleboro!). 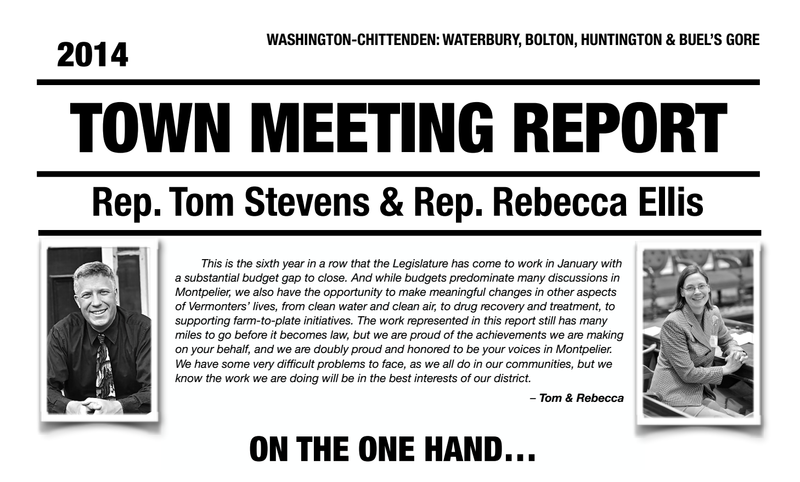 Rebecca and I will be attending Bolton’s town meeting on Monday night, and Huntington’s and Waterbury’s on Tuesday. Here is a link to our Town Meeting Report, which gives a thumbnail sketch of the work we have done thus far in this second session of the biennium. I think I can speak for Rebecca when I say we are proud of the work we are able to accomplish, and frustrated by the work we cannot. The changes in the depth of work we do are getting larger every year — the sense of “business as usual” is long gone. Ways of thinking and ways of doing have been seriously adjusted because of the Great Recession, Tropical Storm Irene, and the ongoing federal funding shenanigans in Washington, DC. This is the sixth year (my whole tenure in the State House) where the anticipated budget gap entering the year has been $70 million or more. Our spending levels on necessary programs are still at pre-recession levels (in real dollars), and we are still seeing the repercussions of the recession in important calculations, such as our statewide education property tax. Federal stimulus funds are long gone, and federal programs like the emergency heating program (LIHEAP) have been cut, leaving the burden to state tax dollars. School funding remains a difficult balance. Local districts retain control of their budgets by approving them, but school boards don’t have much discretion in budgets and investments in one district are often viewed as cadillac spending by others, and the legislature and tax department don’t finally set the tax rate until the final budget numbers are in. But, and this is a big one, each reacts to the needs and wants of the other in an antagonistically symbiotic way. This tension is far worse this year. I have been a substitute teacher in our Waterbury-Duxbury schools this past fall, and I have witnessed the stress inside the buildings in balancing the need to measure students by testing, and the everyday reality of teaching students across the ability spectrum. There is little, if any, fat in the system, and yet flatlining a budget (thus ignoring investments) will raise our tax rate over 10% in every school district in Washington Chittenden. With people’s wages not rising at the same rate, and some properties still recovering from decreases in value due to the recession and the storm(s), we are witnessing a very real crisis. How we handle it will determine how well our economy stabilizes over the next several years. Discussions around property taxes, and education funding, are really discussions about the quality of the education we provide our children. We do get what we pay for: a top five educational system in the US, and, according to one study, top seven in the world. Not too shabby for a small, rural state. We will not dismantle this excellent system, but we must find a way to slow the growth in expense, just as we have started to do with health insurance. Add to this the rough roll out of the federally-mandated exchange, the much needed push for earned sick days and other compassionate job-related policies, a discussion about overall tax policy and campaign finance reform (already passed), this session has been nonstop since January. We hope to see you at Town Meeting, which is your town’s day to be a legislative body. As always, please contact us with your needs and concerns. Filed under Bolton, Buels Gore, Huntington, Legislation, News, Policy, Washington-Chittenden, Waterbury.